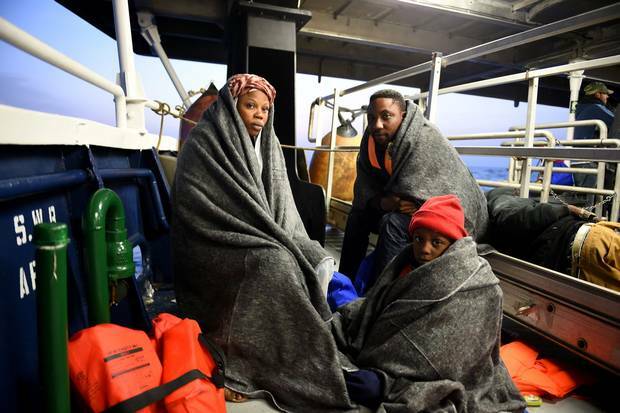 Migrants and refugees are rescued during an operation in the Mediterranean with the Aquarius, a former North Atlantic fisheries protection ship now used by humanitarian groups, on May 24, 2016, off the Libyan coast. With the Balkan migration route through Greece now largely shut down, the flow of people on the Libyan route to Europe has expanded by about 35 per cent from last year. It's an exodus that continues to alarm many European governments, triggering a series of aggressive new measures to clamp down on migration. And beyond Europe, the crackdown is becoming global. Traditional destinations for African migrants – from the United States to South Africa – are becoming harder to reach. New barriers are emerging and harsher restrictions are planned. The tactics range from deportations and visa denials to detention camps and arrests. Wealthier countries, using a combination of financial inducements and security deals, often in co-operation with authoritarian African regimes, are finding new ways to hamper Africans who want to leave their impoverished home countries. Migrants are not the only ones to suffer. Ordinary African visitors, too, have been caught up in the crackdown. When an African trade summit was held in California in late March, organizers were shocked to discover that every African had been denied entry. More than 60 delegates were invited from a dozen African countries, but not a single one was able to secure a U.S. entry visa. The new era of "extreme vetting" is one of many doors slamming shut for African travellers as the backlash intensifies. Even if they escape the Trump administration's list of targeted Muslim-majority countries – which includes three African countries – a growing number of Africans have found it difficult to enter the United States this year. Even those with valid visas are increasingly turned back when they arrive at U.S. airports. The rejection rate for Nigerians at the U.S. border – after they've already received visas – is reported to have substantially increased this year. The campaign has even reached the agenda of the G20 group of countries, which includes Canada. At the G20 summit in July, host country Germany will push for a Compact with Africa to promote private investment in Africa, combined with what it calls a Marshall Plan to funnel billions of dollars in German development aid to Africa – all with the implicit goal of reducing African migration. Some officials say the German aid will have strings attached: African governments won't receive the money until they co-operate with the European crackdown, increasing their interception efforts and accepting planeloads of deported migrants. The most visible crackdown is in the United States, where President Donald Trump's executive orders on refugees and migrants have wreaked havoc for many Africans. His orders were eventually halted by court rulings, but they had already prevented thousands of African refugees from reaching the United States. At the same time, the Trump administration has ordered U.S. embassies to tighten their screening of visa applicants who warrant "increased scrutiny" for security reasons. Africans are among the main targets of this screening. The U.S. restrictions have hindered far more than just refugees, as the California trade summit showed. A number of Nigerians have recently reported that they were detained at U.S. airports or barred from entering the United States, despite having valid U.S. visas. An adviser to Nigerian President Muhammadu Buhari recommended that Nigerians should avoid any non-urgent travel to the United States until the situation was clarified. A man holds a child while a police officer checks his identity in Hilbrow Johannesburg, an area mostly inhabited by foreign nationals, on April 27, 2015. South Africa has conducted heavy-handed raids on businesses to search for foreign workers. 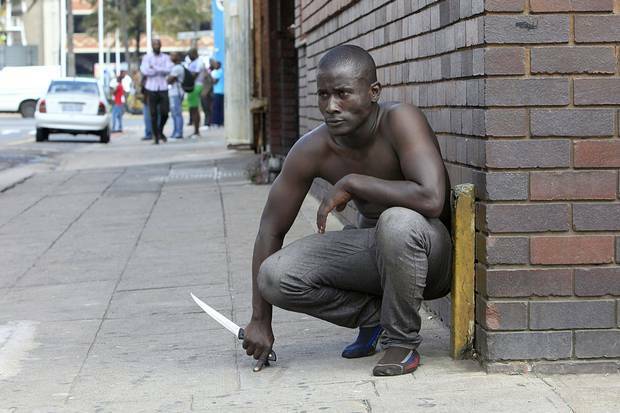 A foreign national holds a knife after clashes between a group of locals and police in Durban on April 14 ,2015, amidst ongoing violence against foreign nationals living in the South African city. In recent years, South Africa has deported as many as 54,000 people annually, almost exclusively to African countries. While the Trump orders have been the most dramatic sign of the crackdown, other countries are launching their own restrictions. Migrants from war-ravaged countries such as Somalia and Sudan usually head northward, to Europe, or southward, to more affluent African countries such as South Africa or Kenya. All of these destinations are increasingly difficult to reach these days. The South African government has begun a high-profile campaign against undocumented foreigners, including arrests, deportations and detention. In recent years, it has deported as many as 54,000 people annually, almost exclusively to African countries. It is requiring all businesses to limit the number of foreign nationals they hire. And it has approved a new migration policy that will prohibit asylum-seekers from seeking employment. The new South African policy will create a system of "processing centres" for migrants at its borders, and a network of detention centres to hold "high risk" migrants – a system that human-rights activists have criticized because it could force migrants into detention for years. Asylum-seekers already face delays of many years in getting their claims assessed. As part of the new campaign, South Africa has conducted heavy-handed raids on businesses to search for foreign workers. In one series of raids at a supermarket chain, 63 foreigners were arrested – even though it was later confirmed that the majority of the arrested foreigners had valid South African work permits. 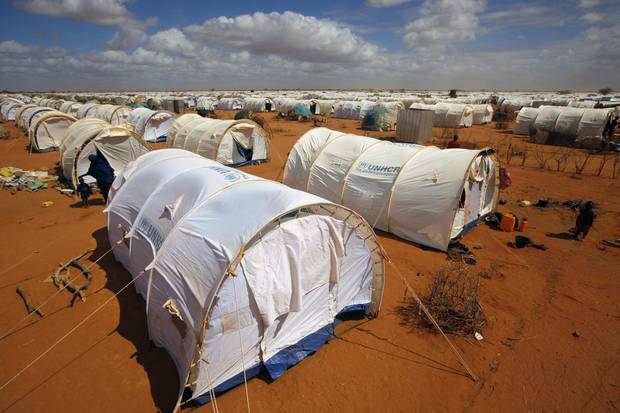 Hundreds of thousands of Somali refugees, meanwhile, have found shelter in Kenya. But now that door, too, is beginning to close. Kenya's police and other authorities have increasingly harassed the Somali refugees and migrants, seeing them as a security risk, even though most are fleeing war and hunger. The Kenyan government is pushing hard for the closure of the Dadaab refugee camp, where more than 300,000 Somali refugees have taken shelter. Kenya is pressuring thousands of the refugees to return to Somalia, and it is aiming to close the camp entirely by the end of May. Tents cover the landscape at the UNHCR’s Ifo Extension camp outside Dadaab, eastern Kenya, 100 kilometres from the Somali border. Migrants fleeing war in Somalia and Sudan usually head south to countries like Kenya or South Africa, or north to Europe. But those destinations are increasingly difficult to reach. 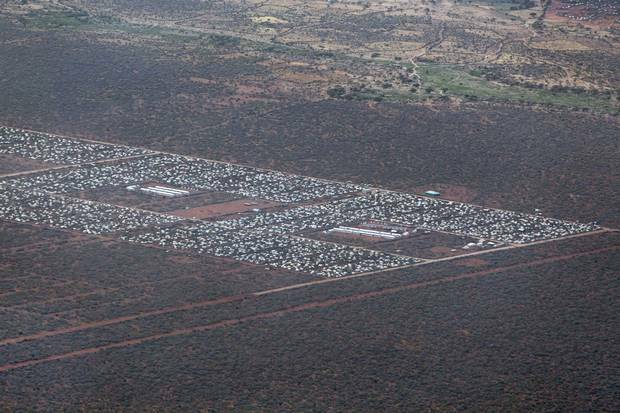 Dadaab, shown in 2012, is the world’s largest refugee camp. The Kenyan government is pushing hard to close Dadaab by the end of May, pressing refugees to return to Somalia. But it is the new European crackdown that could have the most far-reaching effect on African migrants. Many European countries, and the European Union itself, are negotiating opaque deals with African regimes to tighten border controls, reduce the migration flow and send migrants back to their home countries. 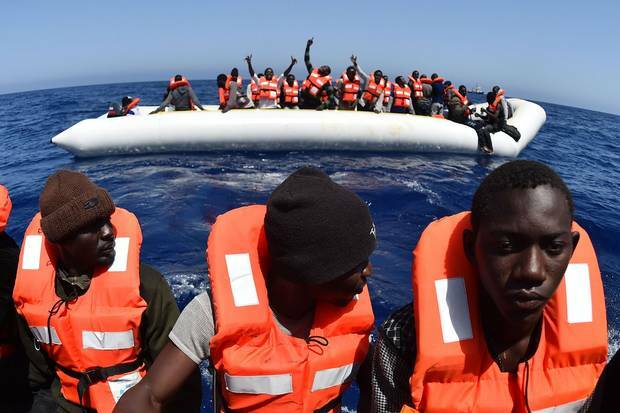 One example of the new tactics is in Libya, where the EU is targeting the Libyan smugglers of migrants, destroying their boats, and providing equipment to the Libyan coast guard to intercept the migrants. A family from Nigeria rests with dry blankets on the deck of the boat MY Phoenix, just minutes after they were rescued . 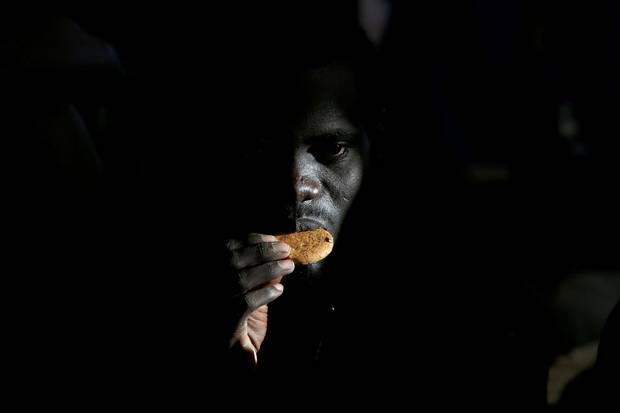 A migrant eats a biscuit on the Migrant Offshore Aid Station ship Topaz Responder after being rescued off the coast of Libya on June 23, 2016. Some of those methods are highly controversial, including a series of security co-operation agreements and deportation deals between the European Union and the repressive regimes of Sudan, Eritrea and other countries. An agreement between the European Union and Sudan last year, for example, included military assistance and "migration management" aid. This has been followed by a wave of arrests of migrants in Sudan, a key transit route to Libya and the Mediterranean. Reports suggest that the European security deals have provided support to Sudan's notorious Janjaweed militia, now known as the Rapid Support Force (RSF), which has been increasingly involved in the arrest of migrants in Sudan. The Janjaweed were infamous for atrocities against civilians in Darfur. Yet the RSF has become the primary security force at Sudan's borders with Libya and Egypt, analysts say. It has arrested and deported hundreds of Eritrean migrants, even though it knew that the Eritreans would be subject to persecution in their home country. "Sudan's strategy for stopping migrant flows on behalf of Europe involves a ruthless crackdown by the RSF on migrants within Sudan," says a new report by Suliman Baldo, an adviser to the Enough Project, a U.S.-based human-rights group. He describes the RSF as "one of the most abusive paramilitary groups in the country" – a group that "stokes violent conflict, commits atrocities and creates massive displacement of populations within Sudan." And yet the militia group "stands to benefit from EU funding," he wrote. There are also reports that EU funds could support the construction of detention centres to lock up migrants at Sudan's borders. "This kind of pressure, outsourcing our dirty work to some of the most brutal tyrants, should be beyond the pale," wrote Lee Crawfurd, an aid researcher, on the website of the Center for Global Development. The detention centre project, he said, is "a strong contender for the worst aid project in the world." As part of its carrot-and-stick strategy against migration, the European Union has used financial inducements to supplement the detention and deportation measures. One EU official has called it "a mix of positive and negative incentives to reward those countries willing to co-operate effectively with us, and to ensure that there are consequences for those who do not." The new money is increasingly attached to a condition: African governments must stem the flow of migrants and promise to accept their citizens who are deported from Europe. "Those who do not co-operate sufficiently cannot hope to benefit from our development aid," said German vice-chancellor Sigmar Gabriel in a German media interview. To persuade African countries to co-operate, the EU is offering billions of dollars worth of increased financial aid to Nigeria, Mali, Senegal, Ethiopia and other African countries. In one of the biggest of these deals, the EU is giving $635-million (U.S.) to the government of Niger, a major transit route from West Africa to the Mediterranean, to encourage it to stop migrants from moving through the country. Much of the EU money is being spent on providing equipment and training to local security forces so that they can intercept and arrest those who operate the smuggling routes through the Sahara northward to Libya and the Mediterranean. This has sharply reduced the flow of migrants through a key transit point, the city of Agadez in Niger. The reduction in migrant numbers is due to "stronger repressive measures" by the government of Niger against the smugglers, according to the International Organization for Migration. But the restrictions might be leading directly to the deaths of some migrants. To avoid arrest, the smugglers and migrants are increasingly turning to more dangerous and circuitous routes through the Sahara. There are reports that dozens of dead bodies are being discovered along the new desert routes. Follow Somali asylum seekers on a cold journey to Manitoba On the third weekend of February, Justin Giovannetti and photographer Ian Willms followed 22 asylum seekers who crossed the American border into Canada near the town of Emerson, Man. How an Afghan refugee’s path to freedom took another twist in France When Mark MacKinnon reported on the story of Mikahil Akbary last fall, the Afghan refugee had found a tentative new home in Switzerland, and was holding fast to his dream of a life, one day, in Canada. Then, the winds of fate began to blow once more.